One big breath of Passive Smoke’s debut and it tastes just right. I’m not a smoker, and I never have been, but a lot of my friends are. I’m pretty passive about it. I mean, I’m not into anyone breathing smoke into my eye sockets, but most people are polite enough not to do that. If I’m honest, though, I’ve gotta say that I’m pretty sick of bearing the cold when I’m outside of a show and the only reason I’m out there is because every single one of my friends has to roll a cigarette. But it’s something you’ve got to grit your teeth through when it’s for the bands you really love and for me, Passive Smoke are worth every bit of that cold wind, every one of those cigarette butts traced all over the ground, and every ounce of energy that it takes to drag myself out to a show once and a while. The debut of Passive Smoke is made up of Eadie, Chiara, Elly, and Pixie-Marie. Their tape Inhale has jangled its way into my brain cells and gotten cozy in between my heart strings. Thick guitars and layered drums frame Eadie – a front woman near shouting, but not quite; almost like a Carrie Brownstein with wobbly knees – and it’s absolutely humbling. Each song fuzzes into one another and at its end is when they work together to radiate the warming feeling that runs through the entirety of the album. It’s a feeling I can’t fully put my finger on; something I can’t entirely put into words – but whatever it is, it’s a feeling that just keeps growing on me more and more every single time I let this tape play through. It’s lined my eardrums and started to wrap itself around the entirety of my brain – because no matter what day of the week it is, or whatever time the clock’s ticked over to, these songs are permanently running through me and the back of my throat can’t help but hum along. Maybe if I’m lucky the feeling will keep on growing and wrap itself around every exposed bit of my skin and keep me warm forever. I won’t even have to bare the cold outside the venue of the next Passive Smoke show. But until then I guess I’ll just have to bear the goosebumps, because the state this tape has left me in has my undivided attention – and I sure won’t be missing a show anytime soon. Inhale sure is a good breath in. 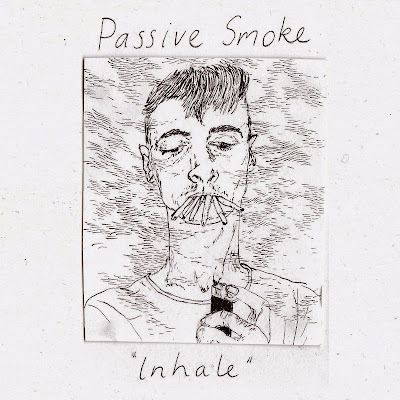 Listen to Passive Smoke on bandcamp.